Many people who crochet in modern times avoided crocheting doilies for a long time. They wonder where they will use them. They assume that all crochet doilies are made with thread and that thread crochet is difficult—both of which are false assumptions. They get so excited about making contemporary things that they don't get interested in making doilies. But at some point in your crochet journey, you might want to explore the joy of doily making. 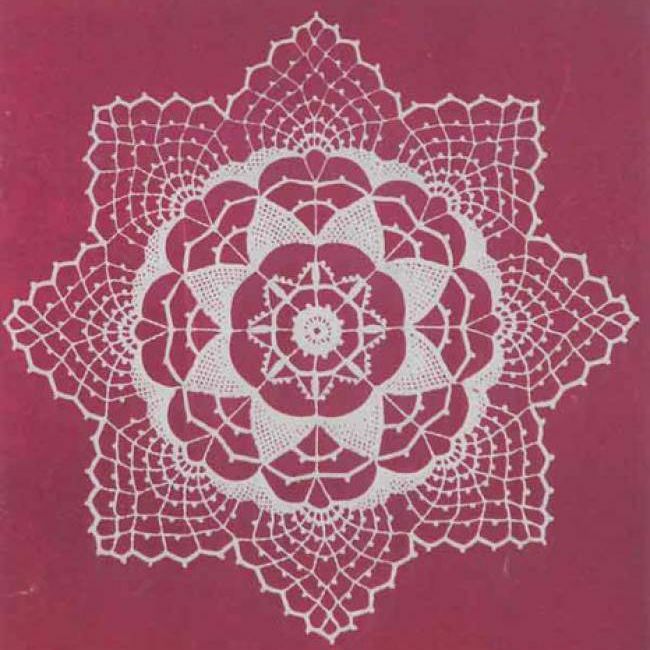 Doilies are circular, making them great projects for meditative crochet. Doilies, like crochet mandalas, can be used as decoration on tables or even framed as beautiful wall art. Alternatively, doilies can serve as the centerpiece for wearable designs including hair accessories, they can be worked up in alternative materials like t-shirt yarn for use as rugs, or they can be wrapped around stones and other up-cycled materials. Many people have been inspired to make doily dresses for proms and other special events. Doilies can be tons of fun. Here are ten free crochet doily patterns, some of ​them vintage and some of them fresh, to inspire you to get started with doily making and design. This article was edited and updated by Kathryn Vercillo. This free crochet doily pattern from Maggie Weldon is what many of us think of as a traditional doily pattern. It is a relatively advanced doily pattern, using special long stitches along with cluster stitches to create a great textured openwork design. People who are comfortable working in thread crochet to create doilies and want to take on a challenge will find this to be a fun design. Although most doilies that you will come across are worked entirely in the round as pure circles, you will occasionally discover an amazing doily like this one that is comprised of motifs. This is a vintage thread crochet pattern comprised of spiral medallion motifs that are stitched together to create the full doily. As mentioned, crochet doilies are typically round but you can make them in other shapes as well, especially if you want to get a more contemporary look when using them for home decor. This is a three-sided (triangle-shaped) crochet doily pattern offered free from Crochet Galore. She notes that if you stop about two-thirds of the way through the pattern, you'll have a coaster-sized doily. This is a thread crochet pattern but you could work it in a thicker yarn to make a triangle blanket or rug using this doily design. Rainbow Dandelion has a great array of crochet doily and motif patterns, many inspired by vintage designs but filled with modern flair. This one is a second example of how a doily can be done in the shape of a triangle. This is a free crochet pattern available as a download through Ravelry. The choice of yarn and the laciness of the open design give this a completely different style than the one above by Crochet Galore. One of the best things that you can do is to play around a lot with changing yarn types and hook sizes while working crochet doily patterns so that you can achieve a variety of different effects. You could make an entire wall art display of just doilies worked in this way. Designer Frank O'Randle created one of the most popular crochet circle blanket designs ever, called the Rings of Change. He also shows how you can use just the first third of that crochet pattern to create a beautiful, detailed doily. The doily can be made in a single solid color, as shown here, or worked in many, many colors like his larger designs usually are. This was originally a Portuguese crochet pattern by Marcia Galti but it has been translated into English with a photo tutorial. It's a great crochet pattern because it has the classic circular design of a doily but it uses techniques from filet crochet to create a beautiful repeating heart pattern that makes the piece really special. This a terrific centerpiece for a Valentine's dinner date but can also work throughout the year with all different types of table settings. Crochet designer Sonea Delvon used three different colors of cotton thread when creating this free crochet doily pattern because she wanted to give it a fun, modern look. You can take a cue from this design and utilize different thread colors in any doily design to achieve a more contemporary look. This is a Ravelry download that has both written instructions and charts. This free doily crochet pattern is from BellaCrochet, one of the best contemporary doily designers. It was designed as a Thanksgiving crochet pattern, but it would certainly work throughout the fall season, and you could even adapt the coloring to make it a doily you could use in your home all year long. This designer has a large array of free doily crochet patterns for all different types of holidays so take some time to peruse through her blog and find the doily design that is right for you! One of the best ways to display a crochet doily is to encase it in a beautiful embroidery hoop and hang it on your wall as art. That is the intention for these two small (3") crochet doily patterns from A La Sascha. These sweet, simple designs are also great as motifs for other projects, too. Crochet In Paternoster is always making wonderful things using t-shirt yarn. This doily rug is a terrific example of that. Her free crochet pattern could be a traditional doily if it were worked in thread with a small hook but instead it is worked with thick, chunky, beautifully pink t-shirt yarn and a large hook that creates a cushy circular rug. Switch out any doily pattern for this type of yarn and see what items you can create!